As CBR Products is a Unicycle Creative client, I have to come clean: This review will be incredibly positive. But besides being their Marketing Guy, I also use their products on my cabin at Lillooet Lake. So I’m sold on the stuff for all the right reasons. Perhaps CBR’s most famous product is BRODA® PRO-TEK-TOR, a natural oil wood stain that is actually water-borne, so it has low-VOC’s and cleans up with water. Yet still lasts like crazy and comes in over 50 stock colours. The BRODA® line also offers CLARITY Acrylics and PRO-THANE urethanes, which are water-based and tintable. It’s also locally manufactured right here in Vancouver, so there’s less shipping carbon. The team was also showing off the SAFECOAT® line of paints by AFM. These are manufactured in the US (CBR is the Canadian Distributor) but are one of the best non-toxic paints you can get. 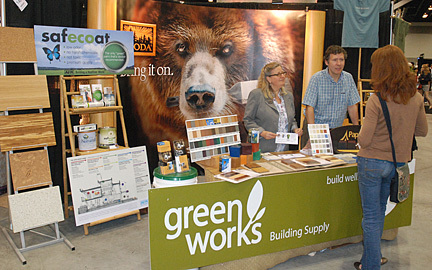 At this show, CBR shared a booth with Greenworks Building Supply (Featured in Green Briefs way back in 07) so there were other unique products on display, such as the PaperStone line of counter tops, that look and feel like some sort of coloured slate, but are actually made from recycled paper bonded with a bio-friendly resin. Green Briefs Marketing Thoughts: Well, I like the way the booth was anchored with a backdrop featuring the arresting signature CBR image (the BRODA® Bear). There was a nice selection of samples available for easy discussion, and the whole effect was warm and earthy. Next time, however, I’d like to incorporate some sort of product demonstration. As a customer, using the BRODA® product is such a pleasant part of the brand experience, it seems a shame not to share it. Previous: « Sundog Clothesline Company A green marketer’s dry dream.